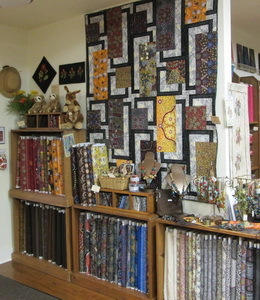 This picture shows only a portion of the batiks we stock. You will find fabrics from the latest collections by Hoffman, Robert Kaufman, Moda, Anthology and Island Batik. We always have finished quilts to show how these fabrics can be used together. While you are wandering in the shop, be sure and see all the wonderful antique spool cabinets we have. Visit the Cotton Batiks section of our online store for our extensive online selection of cotton batiks. We have carried Australian prints for over 10 years in the shop. Our inventory has steadily increased as the interest in these unusual and dramatic prints has risen. One of our favorite quilts to use with these prints is BQ4 by Maple Island. It allows you to present these great prints and showcase them in a quilt. We hope you will visit our “Australian” department and see what great things you might create with these fabrics. You can see many of our Australian fabrics on the Australian Fabrics page of our online store. While you are pondering which quilt to make, you could easily be tempted by some of the great jewlery we have displayed with these fabrics. Along comes a notion….or two! Once in a great while, a wonderful new notion comes along. This time we actually have 2 fabulous ones. We all have lots of useful tools but, we know you will love both of these new gadgets. This looks like a pretty simple little plastic thing. It is, but it really fixes an issue anyone who uses threads and bobbins has run into. It’s always a struggle to keep your bobbin and spool of thread together. With the funky little “Bobbin Buddie” it is no longer an issue. Squeeze the open ends together and stick them thru your bobbin. Wrap the loose end of the bobbin thread around the”bobbin buddie”. 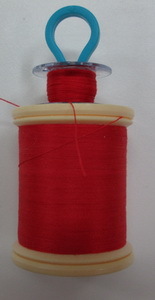 Squeeze the open ends of the “Bobbin Buddie” and stick them into your spool of thread. They will expand to fit any thread opening. If you don’t have a way to keep the thread on your spool from coming unwound, bring the loose end of thread up and around the “bobbin buddie”. This will keep everything neat and tidy. The first 100 we received were purchased by one customer. The next 100 we received was split by two customers. We now have plenty of them in stock. We have them in bags of 20 for $7.99. You can find the Bobbin Buddie on our website under Notions. To go directly to the Bobbin Buddie page click here. The Thread Director is a thread stand that attaches right to your bobbin winder or an upright spool pin on your machine. We have waited for years for someone to “invent” this wonderful helper. If you use metallic threads, you need this one. 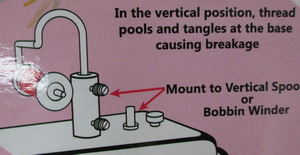 This illustration shows how this goes on your upright thread spool or bobbin winder. 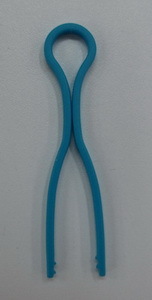 The Thread Director allows your difficult threads to come off the spool evenly so they don’t twist like a garden hose. Thread will feed off smoothly so now all those embroidery projects and decorative sewing techniques that call for metallic thread will be a breeze. The Thread Director sells for $24.99. You can find it on our website under the Notions. To go directly to the Thread Director page, click here. If you haven’t been by the shop lately, you will want to stop and take a close look at the marvelous quilt. 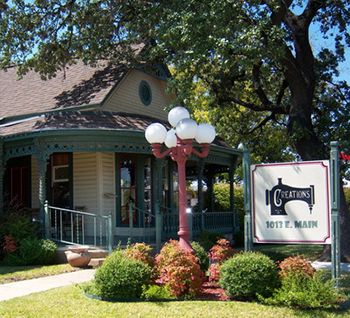 It was made by Elaine Granstrom of Leakey. She did it on her Quattro Brother Embroidery machine. It could be done on any embroidery machine with at least and 8 x 12 hoop size, but the Brother made it so much easier with the use of the built in camera. She was able to see where her placement was actually going to be. Now I am not saying this is immediate gratification, but Elaine stuck to it and made this incredible quilt. 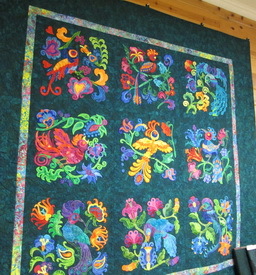 The quilting, by Serena Manning, is just the finishing touch. We are so proud to be able to display this piece…. Come check it out and let us help you get started on yours. To order the Bird of Paradise Embroidery Cd, click here. 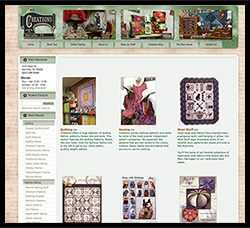 Creations has great stuff for the quilter and sewing enthusiast! 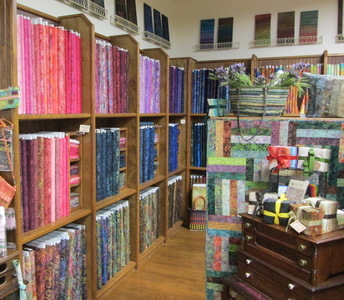 We’ve been specializing in fabrics, patterns and supplies for quilters and sewers for over 30 years. 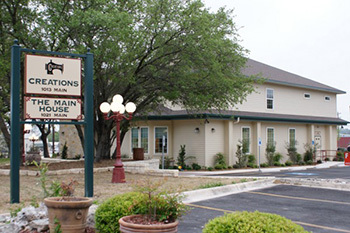 We are located in Kerrville, in the heart of the Texas Hill Country at 1013 Main. Our phone number is 830-896-8088. We’re open Sundays from 12:30 to 4:00 as well as our regular days — Monday thru Saturday, 9:30 – 5:30. We carry a wide range of fabrics, patterns and books for quilting, clothing sewing, wearable art, embroidery, wool projects, and home decor. We even have lots of fun accessories like purses, totes, jewelry and a variety of nice things to decorate your home. We are an authorized dealer for Brother. 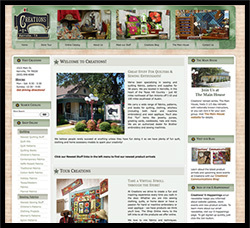 To learn more about Creations and to shop at our online store, visit our website at: www.creations-online.com. 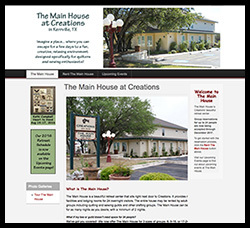 Next door to Creations, you’ll find our retreat center The Main House. 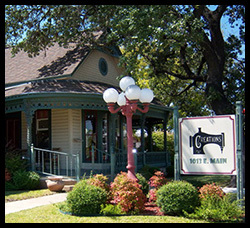 The Main House, hosts 3 1/2 day quilting and sewing retreats with nationally known instructors, or you can rent it for your own group. Visit The Main House website for details.